In this image we see the mummified remains of John Hartnell, a 25-year-old member of the Franklin Expedition who died on January 4, 1846 and was buried at Beechey Island in the Canadian Arctic. The examination of his body revealed some surprising things. Image online, courtesy University of Alberta. In the 1490s, John Cabot (an Italian, Giovanni Caboto, who Anglicized his name while sailing for Britain) suggested that a Northwest Passage must exist, providing direct access between Asia and North America. The Inuit, having lived in the Arctic for thousands of years, likely knew about such an ice-clogged water way. But for Europeans, excited about discovery and adventure, the search would soon be on. By the 16th century, explorers wishing to reach the Orient by avoiding the long, unsafe routes around Cape Horn (at the tip of South America) and the Cape of Good Hope (at the tip of Africa), mounted expeditions to the area now known as the Canadian Arctic. It took three centuries, and many explorers, to discover that a water route exists. For many, trying to find a passage though the maze of ice and islands would require their lives. One of those who died was Sir John Franklin. When Franklin, a 60-year-old Englishman, mounted his third expedition to the Arctic (on May 12, 1845), he had two excellent ships (the Terror and Erebus). 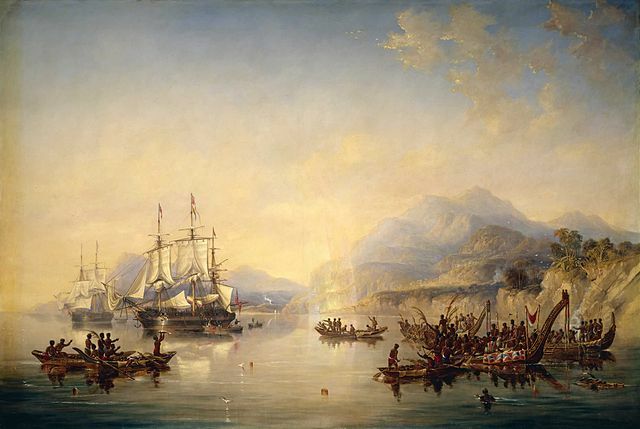 A painting by John Wilson Carmichael, circa 1847—"Erebus and the Terror in New Zealand, August 1841"—depicts the two ships as they appeared a few years before the 1845 Arctic mission. Franklin also had 129 crew members and, significantly, a faulty map. He believed he had enough supplies on board to last the length of the trip. No one could have known that the supplies they carried would contribute to the loss of the mission and the death of the whole crew. Later, when people in England realized the expedition must have encountered serious trouble, other explorers set out to locate the missing men. Some, searching for first-hand evidence, talked with Inuit people who had seen Franklin. In fact, both ships were hopelessly trapped in ice at King William Island (in Victoria Strait). 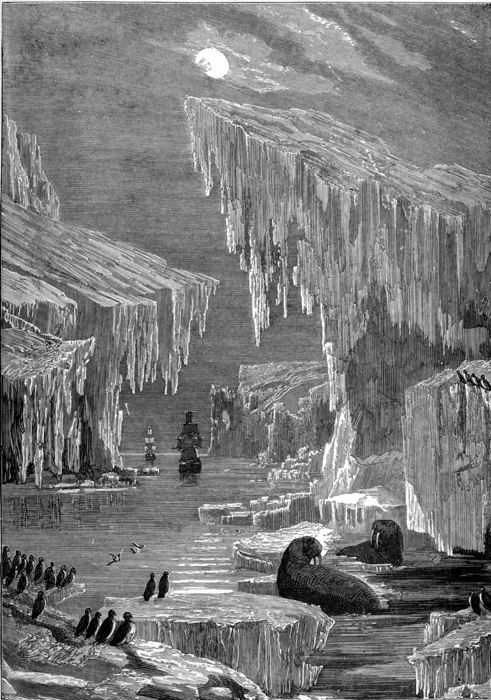 In The Sea: Its Stirring Story of Adventure, Peril, & Heroism, Volume 3 (by Frederick Whymper and published by Cassell, Petter, Galpin & Co.), we see an illustration of “The Erebus and the Terror among Icebergs.” The drawing (illustration 43) appears in Chapter 22, entitled “Franklin’s Last Voyage,” opposite page 206. When supplies were insufficient, some of the men left the ship, walking to find food. Unlike Ernest Shackleton and the men of the Endurance - who hoped to explore Antarctica, home of the Emperor Penguins, but instead endured their own ice-crushing-the-ship disaster - men of the Franklin Expedition had a bleak future. Not only enduring intense cold, having no food and deserting their ships, they were incapable of exercising good judgment. How do we know that? The graves of three crew members were discovered at their camp on Beechey Island. The intense cold had turned them into mummies. Mummies have intact soft tissue which can be analyzed. When reports on the mummified remains of Franklin’s three crew members were completed, the results were startling. The men had contracted severe lead poisoning. Coupling that information with evidence the British Admiralty already had - by 1852 the Admiralty knew that Goldner’s Patent Meats were contaminated - it was logical to conclude what had happened. The crew’s food supply, stored in lead-soldered (since-rusted) tin cans, was the source of the poison. Scientists believe the men were slowly driven insane as a direct result. Their graves are on the beach at Beechey Island. John Torrington may have been the first to die. His marker reflects the date of his death: January 18, 1846. Because of the extreme cold in the Canadian arctic, his body was incredibly well preserved. The mummified remains of John Hartnell contained lots of hair which helped Dr. Owen Beattie find evidence of lead poisoning. William Braine, whose mummified remains were nearby Torrington's, died on April 3, 1846. He had served aboard HMS Erebus. Since Franklin located the last piece of the Northwest Passage waterway, Peel Sound, he has been credited with its discovery. That isn't the last word on Franklin's Third Expedition to the Arctic, however. During those ice-packed, difficult days, Francis Rawdon Moira Crozier (Franklin’s second-in-command) had written a note which was later found by people searching for the missing expedition. Dated April 25, 1848, the note states that both the Erebus and the Terror were abandoned on April 22nd of that year. It also says that surviving crew members were planning to walk to Back’s Fish River. Franklin, according to Crozier, had died on the 11th of June, 1847. Crozier's note, however, does not discuss Sir John’s cause of death. Historians believe the Expedition’s commander was likely buried in the ice. Early reports from the Inuit had accurately revealed where Franklin and his ships were lost. The problem was that few investigators believed them, so the initial search areas for the lost Expedition were off-the-mark. 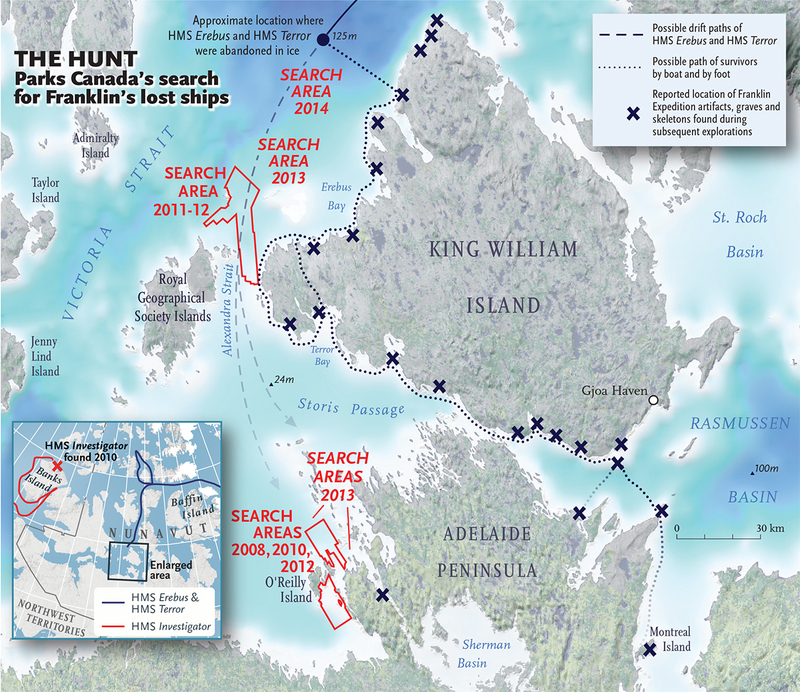 Chris Brackley, of Canadian Geographic, depicts the search efforts for Sir John Franklin’s lost ships by Parks Canada. Year after year searchers located Expedition artifacts, but they did not find reliable evidence of either the Erebus or the Terror. Then .... hundreds of years after Franklin and his men were last-sighted ... a stunning development occurred in the Canadian Arctic. During 2014, an underwater archaeological expedition found one of the ships (either the Erebus or the Terror) off the upper northwestern shore of King William Island. Not long after the discovery, the ship was identified as the Erebus. Experts hoped to find the other vessel—likely hidden from view in the same general area—so they kept searching for two more years. In September of 2016, members of the Artic Research Foundation released an amazing video. They'd found another sunken vessel, "perfectly preserved" in 24 meters of water, north of where the Erebus had come to rest. Experts are sure they have found the long-lost Terror, missing for about 170 years. The discovery of HMS Terror would be important for Canada, reflecting the ongoing and valuable role of Inuit traditional knowledge in the search and making a significant contribution to completing the Franklin story. The next stop on our virtual voyage of discovery is Egypt ... home to many mummies. Bos, Carole "FRANKLIN EXPEDITION MUMMIES" AwesomeStories.com. Sep 01, 2006. Apr 25, 2019.